This tutorial is to help you get a good idea of how I do things. This tutorial is NOT intended to be copied exactly and it is NOT a stock image. Any over painting or using my images pasted in any way in YOUR work is prohibited. Please learn from it but don't post exact copies of this in your gallery. And remember, the number one way to get better is to keep creating art! Thank you.Painting realistic skin is hard and require a lot of time i need to practice a lot. Thank you! I'm a beginner, but this is easy to understand! Is this done via Photoshop CC? 'Cause I don't have the option for "other dynamics"
Thank you, even as a beginner it helped me a lot. Thank you for a wonderful tutorial! 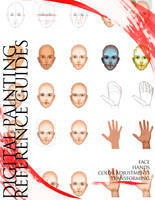 So helpful to have someone explain a method for picking out skin tones. Thank you so much for doing this. It's really, really helping a complete and utter noob. Now finally a tutorial whiich shows how you can put down skintones easily, you have no idea how much I love you for this! Been fighting years on finding a good way to put down skintones! Thank you, thank you so much! ... I don't... see the "other Dynamics" at all..
WOW I gave up A LOT when I did digital painting; now that I've actually tried with your method I'm getting the hang of it! Thanks so much! You're my best! thanks for the tutorial! Nice tutorial!!! can i ask you if u just use brush or u use the smudge too to mix colors?? I can't find the whole "shape dynamics" "other dynamics" "jitter" thing...I'm using a trial version of Corel Painter 12, so do you know anything that can help? Sorry, I don't know Corel Painter at all. Wish I could help. That's ok I'll look around. Thank you so much for this tutorial, especially the details about picking colors. Color theory is tough for me, but this is a great step in learning more. This puts things in a new perspective for me. I tend to freak out when I go into realism style painting. I can do well in traditional drawing with blending and smoothing, but if I go into any painting, my brain goes out the window. This breaks it down in concepts I can grasp at visually. I'm the same way. I prefer using traditional methods in my work because that's how I learned to draw. Digital or not the process is the same. That's one reason why I love Wacom's products. They go out of their way to make it feel traditional in the creating process. The pen that records drawing movements really blew my mind. I suppose translating drawing into digital painting may help me learn traditional painting better. Everyone has their learning process. Thank you for posting this tutorial. May I ask what pressure setting you use for you stylus in the Wacom control pane. The default medium, or something with more pressure (to the left) or less pressure (to the right)? Sorry I never saw this comment. Not sure what happened there but I just use the default settings as far as I know. Using this painting method looks really time consuming. In theory, it shouldn't be as time consuming if you've had painting and figure drawing classes, but even if you haven't (which I have...), and you just so happen to draw/paint really fast...could this process get done pretty quick? I'm asking, cause I really love painting this way. I just don't very good patience. I want things done when I want them done, lol. But I also want them to look good. And I work fast. I've been able to come up with some pretty decent stuff even with my working speed, as far as figure drawing goes. But do you necessarily -have- to spend hours and hours on this kind of painting to get it to look right, or could the same results be done by a quick, restless hand? Nope, it's not fast. This method takes me around 20 hours. If you are looking for a speed painting tutorial you are likely to have more loose strokes and less finessing- which is fine, but that is not this style per se. 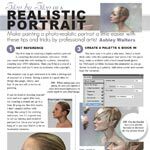 And yes, as listed at the top of the tutorial this is for intermediate painters (those who have anatomy to at least a passable level). I have found that if you reduce the file size to say half of what you see here you ought to cut the time back some. Hope that helps! I'm not sure what you are asking. What part about it don't you understand? I assume you have photoshop? Did you know the average person wastes a staggering 64 hours a year by neglecting to use keyboard shortcuts? Time is a precious resource. Don't squander it hunting for tools when you could be painting instead. Whether you're a novice or a seasoned pro, the time you invest in learning a few shortcuts will be well worth the added efficiency boost. 5 Expert Tips for a Stellar PortfolioThe greatest asset of an artist seeking work is an outstanding portfolio. I can think of no other industry in which skill level can trump a degree to such an extent. Self taught? No problem. Prove you know what you're doing and you're hired. But how do you know what to include in your portfolio? Is it really that big of a deal?